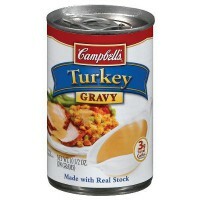 No need to go to the trouble of cooking a turkey; Campbells takes care of the tricky part for you! Campbell's Turkey Gravy brings you all of the flavor with none of the work. Excellent for any holiday season spread, this smooth gravy sauce is made with real turkey stock, and tastes fantastic with potatoes, stuffing, chicken or turkey meat, green beans... the sky is the limit! Store in refrigerator in a separate container after opening. Heat in microwave using microwave-safe container, or prepare in saucepan while stirring continuously. Turkey stock, wheat flour, modified food starch, less than 2% of: chicken fat, salt, yeast extract, turkey fat, dehydrated onions, chicken stock, flavoring, color E150, dehydrated chicken. Contains GMO. Nutrition facts (for 100ml): calories 42Kcal, total fat 1.7g (saturated fat 0.8g), total carbohydrate 5g (sugar 1.7g), protein 1.7g, salt 1.1g.